What is the dosage of levothyroxine Sodium? How do you calculate the correct dose of levothyroxine? Your health care provider will calculate the appropriate dose of levothyroxine sodium based on lab test. The test will indicate whether or not your body is making the correct amount of thyroid hormone. The dosage forms available at the pharmacy will indicate the dose in milligrams (mg) or micrograms (mcg). The following doses are available commercially. Always contact your doctor if you believe you need your levothyroxine dose adjusted. Symptoms that may indicate your dose is too low could be: brittle hair, dry skin, drowsiness. Symptoms that may indicate your dose is too high could be: racing heart, difficulty sleeping, anxiety and nervousness. Contact your pharmacist if you have any questions about taking and using thyroid replacement correctly. Are you paying the best price for your medications? Use my price checker to see if you could be saving money. 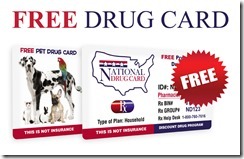 If the price is better print the card or take a screen shot of it to your pharmacy and save! Or, I will mail you a card for FREE! The pharmaceutical information on this site is provided as an information resource only, and is not to be used or relied on for any diagnostic or treatment purposes. This information is not intended to be patient education and should not be used as a substitute for professional diagnosis and treatment.